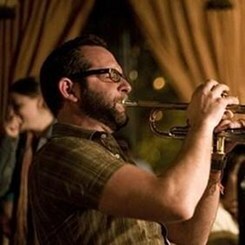 Bob Miller has been teaching and playing trumpet professionally since 1991. He graduated from Towson State University with a degree in Music Education in 1995 and went on to do Master's work in jazz at Virginia Commonwealth University. He has appeared on over 50 recordings ranging from jazz to folk to latin to rock and roll, including albums with Bio Ritmo, Matthew E. White, The Mountain Goats, Megafaun, Steven Bernstein, The Squirrel Nut Zippers, David Karsten Daniels, Sarah Lee Guthrie, and Marion James. He has been honored to share the stage with artists such as Justin Vernon (Bon Iver), Sharon Van Etten, Ken Vandermark, Clark Terry, Dave Holland, John Pizzarelli, Don Byron, Uri Caine, Poncho Sanchez, Eddie and Gerald Levert, and Barry Harris as well as most of the artists on whose recordings he has appeared. His open-minded approach to music has made him a highly sought after studio musician and freelance artist. Current projects include old-school salsa outfit Bio Ritmo, Avant-jazz groups The Scott Clark 4tet and Fight the Big Bull, Modern Americana artist Matthew E. White and numerous other projects in the Richmond, VA area including Fear of Music, Hi-Steps and Microwaves.